January 9 – The Vice President and Minister for Internal Affairs, Hon. Teima Onorio, met with the KiLGA’s Executive Board, in Bairiki, to discuss, inter alia, the need for a better coordination of the two organisations’ work. The Vice President said that work normally undertaken by her Ministry are being carried out by the Association, such as making Strategic Plans for Councils. This is creating a duplication that could be costly in terms of resources and time. On the issue of the delay to the approval of Councils’ Annual Estimates for 2013, she explained that work done to ensure that the legal requirements for the estimates are in place was the main cause. Although the work has delayed 2013 Estimates, it has also helped speed up work on those for 2014. The Executive Board held a discussion with staff of the Kiribati Tourism Office (KTO) on 10 January, on how to encourage tourism on the outer islands. At the meeting, the Director of Tourism, Ms. Reei Onorio, explained that the KTO is happy to assist Councils develop their own, or private guesthouses, to the Mauri Mark standards. They can also promote cultural events and historical sites, unique to the islands, so that visitors are encouraged to go there. 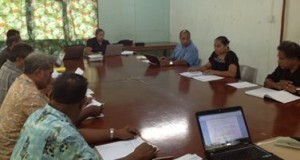 A team from CLGF, comprising Feue Tipu (Governance Officer), Akuila Masi (Monitoring Officer) and Shailendra Prasad (Finance Manager), spent over a week in Tarawa, from 20 January, to develop the Ministry of Internal Affairs’ Strategic Plan and a template to be used for Councils’ Strategic Plans. F$10,000 has been promised by the CLGF as its assistance towards KiLGA’s Bulk Purchase scheme that will involve the ordering in bulk of stationery for Councils’ needs. As part of the deal. KiLGA will undertake a feasibility study and provide a suitable business plan for the scheme. The scheme is a business venture that will take advantage of the increasing stationery needs of the Councils and the government allocation for stationery for Councils that amounts to $20,000 annually. It will involve partnerships with other LGAs such as the Local Government Association of Queensland (LGAQ) and the Hunters Group of Councils in NSW. A CLGF Pacific-funded TA, Mr Henry Sanday, (pictured) worked with the Ministry of Intermal Affairs (MIA), Teinainano Urban Council (TUC), Betio Town Council (BTC), KiLGA and other stakeholders, on a scoping study aimed at developing Local Economic Development (LED) by Councils. 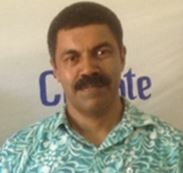 The Councillor for Teaoraereke East Ward, in the Teinainano Urban Council area, Cllr. Birikiti Biriko, has asked KiLGA to assist him convey a request from his people, to Tom Crist of Galgary, Canada, to help finance home gardening development projects in his community. In a visit to KiLGA’s office on 10 January, the Councillor sought the assistance of the Association to initiate contacts with Tom Crist. A message sent to the CLGF office in London, asking for contact details of the Local Government Association in Galgary, has not been successful. From February 3, the two staff of KiLGA were contracted by KiLGA under the National Conditions of Service guidelines and conditions. The Executive Officer, Rikiaua Takeke and the Finance & Admin Officer, Rae Bainteiti, were paid on government salary levels of L6-5 and L11-9, respectively. 17 February—KiLGA met with Acting Chief Registrar (CR) of the High Court, Sr. Bernadette Eberi, (pictured) at her offie to discuss the proposal by the Nikunau Island Council to formulate a project for the construction of the Island’s Court House and office of the Court Clerk. In late 2012, a team led by the Chief Justice and the CR, was on Nikunau for a workshop for all Magistrates from Southern Islands. It was then that the CR came to realise that the island had no Court house and that court sessions were held at the Council mwaneaba. Unfortunately, the sessions were subject to distractions, disturbances, interruptions and even cancellations. At that time, the CR and the Council saw the need for the construction of a court house immediately. Several options were considered including one, the rehabilitation of a former KIT prototype house that was running down and, two, the conversion of an unused garage to a court house. The idea was again taken up to the EO of KiLGA during his visit to the island for his Profiling work. The Senior Trade Officer of the Ministry of Commerce, Industries and Cooperatives (MCIC), Ms. Roreti Eritai, paid a visit to KiLGA on 19 February to discuss ways to process toddy products and enhance handicrafts for export. On the issue of handicrafts, Ms. Eritai advised that her Ministry is keen to support initiatives on the production and export of handicrafts that are of high quality. On the proposal to reprocess and bottle kamwaimwai and bwakamaieta as health foods and delicacies, she advised that there are simple and inexpensive machines that can be used to process and bottle kamwimwai (toddy syrup) and bwakamaieta (toddy-coconut cream mixture) to international export standards. 21 February – The Kiribati National Experts Group on Climate Change (KNEG) held a meeting at the RAK Conference Centre in Antebuka to finalise the Island Vulnerability Assessment (IVA) report and Strategic Plan for Abaiang. 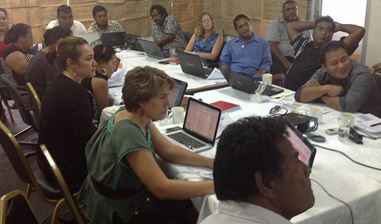 Participants included all members of the KNEG and the visiting officials from GIZ and SPC based in Fiji. These include Hanna Sabass (GIZ) and Asrael and Siva from SPC.